Georges Seurat was a painter who was interested in shape and pattern, but he approached these things in a very unusual way. He was the developer of a very scientific way of painting known as pointillism. He used tiny dots of pure color, side by side to build form in his paintings. These tiny dots of paint, when side by side, give the viewer’s eye a chance to blend the color optically, rather than having the colors readily blended on the canvas. This was also known as divisionism. Cut a corn shape (oval) from a piece of thick paper. Glue the corn shape onto a sheet of construction paper. (We used black). 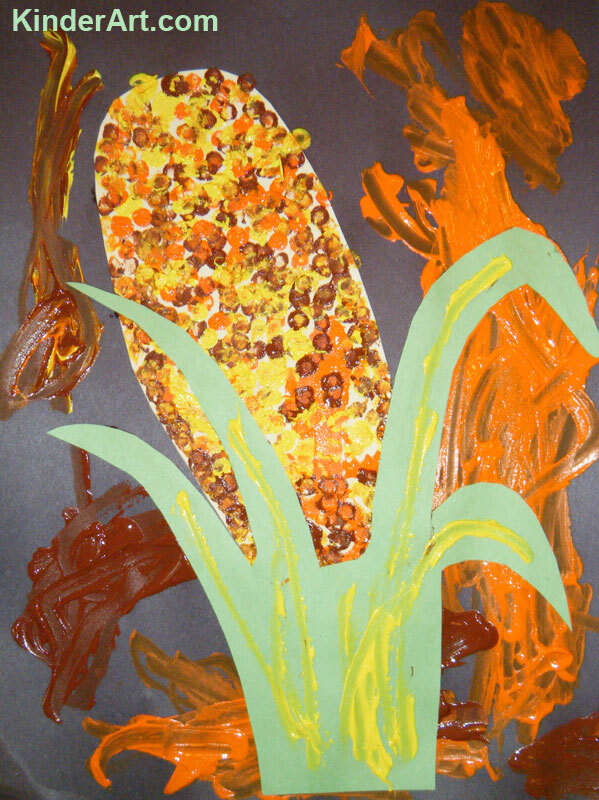 Use Q-Tips® dipped into paint to create corn kernel spots on the thick paper. Cut corn husk shapes from construction paper. Glue these pieces down on top of the corn. Optional – you might choose to embellish the background with paint – like we did.